Kevin Harvick #4 Busch Fishing Chevy SS-I’m shocked at how good the fish design looks. When I heard about this scheme, I thought it would be overdone, but it looks really good, and earns an A+. Regan Smith #7 Golden Corral Chevy SS-I’m not a fan of some of Golden Corral’s schemes, but this one works very well. It has a great color scheme, and the smooth design looks great, and earns an A+. Danica Patrick #10 Nature’s Bakery/April O’Neil Chevy SS-Well that escalated fast! We went from one of the best Danica schemes to one of the worst Danica schemes ever! If the design was plain blue with the Turtles and April, I would give it a C-, but the needless designs make it look worse, and I can’t give it higher than an F.
Tony Stewart #14 Mobil 1 Advanced Fuel Economy Chevy SS-Same basic scheme as Mobil 1, Same A+ Grade. Clint Bowyer #15 AccuDoc Solutions Chevy SS-If it followed the same template as the rest of Clint’s schemes, I would grade it an A, but the stripes on the sides are blah, and it takes the scheme down to a B-. Kyle Busch #18 M&M’s Red Nose Day Toyota Camry-Same scheme as last year, same A+ grade. David Ragan #23 Schuler Systems Toyota Camry-Same scheme as #83, same D-grade. Paul Menard #27 Menard’s/Nebco Chevy SS-Same basic scheme as last year, same A+ grade. Bobby Labonte #32 Rimrock Devlin Ford Fusion-I’ve gotten a headache from trying to figure out why Rimrock Devin used a scheme from 2015, THAT WASN’T EVEN THEIRS! Last year, Rimrock Devlin had a bad scheme, and C&J Energy had a bad scheme, and for whatever reason, Rimrock decided to use C&J’s scheme, rather than design their own. Anyway, it was an F grade last year, and it’s an F grade this year. Chris Buescher #34 Love’s/CSX Play It Safe Ford Fusion-Same basic scheme as Love’s same A+ grade. David Gilliland #35 Southern Belle Seafood Ford Fusion-Except for the number change, same scheme as last year, same A+ grade. Michael Annett #46 Allstate Peterbuilt Group Chevy SS-Same scheme as last year, same A grade. Aric Almirola #43 Fresh From Florida Ford Fusion-Same scheme as last year, same F grade. AJ Allmendinger #47 Bruce Hill Throwback Chevy SS-I like a good throwback, and this is a good throwback. I also give special credit for finding a paint scheme not many people have seen before. Add it the good color and design schemes, and it’s easy to see why this scheme earns an A+. AJ Allmendinger #47 Dillons/Glad Chevy SS-Same basic scheme as last year, same A+ grade. 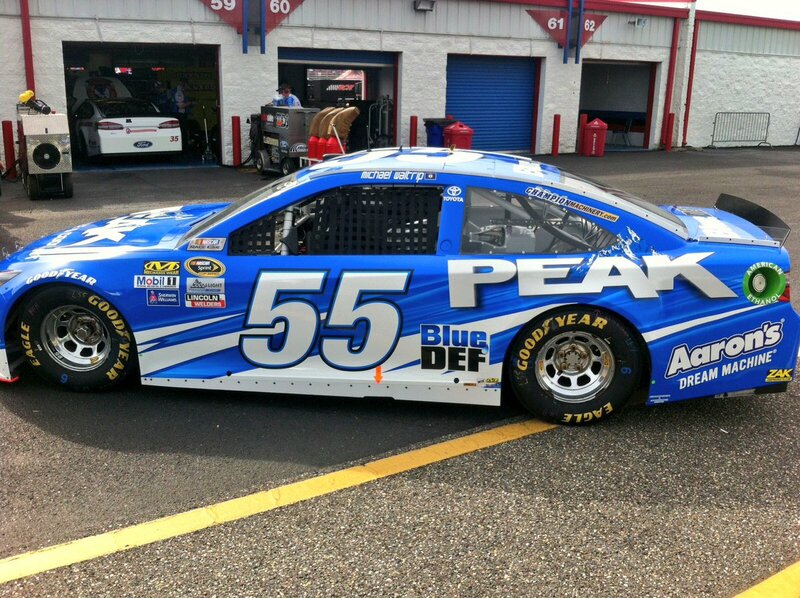 Michael Waltrip #55 Peak Chevy SS-Same as Clint Bowyer’s #15, same A+ grade. Matt DiBenedetto #83 Dustless Blasting Toyota Camry-Same as #93, same B- grade. Dale Earnhardt Jr. #88 Nationwide Children’s Hospital Chevy SS-Dark blue works well. The butterflies are a bit gaudy, but it works, and the donor names are a nice touch. It’s an A+ grade.